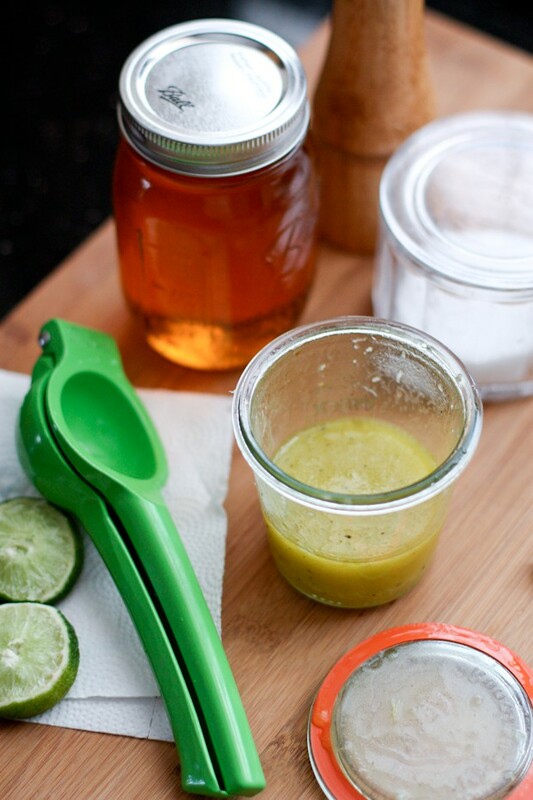 Honey Lime Vinaigrette - Use as Salad Dressing or Marinade! 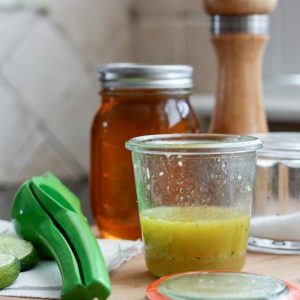 Use this Honey Lime Vinaigrette recipe as a marinade for grilled chicken or seafood, or as a dressing for your next salad. Fresh and delicious! I don’t know about you, but I’m ready to get back in the salad again. Although soup really is one of my g0-to favorite ways to fill up (any time of the year), salads are high up on the list as well (if you’ve been reading my blog for a while then you probably know how much I love salad by now!). Obviously fresh salad ingredients are important when getting back into the salad making mood. For me, the salad dressing is equally important. Although I do occasionally pick up a bottle of dressing from the store, I find that I am more into eating salads when I make my own dressing at home. It tastes better that’s for sure and once you get back into the habit of making them, they truly are simple as can be. Like this Lime Dressing recipe? Pin it here! How do you store homemade vinaigrette? This is probably one of the most asked questions I’ve come across when it comes to homemade salad dressings. It’s best to store homemade dressing in a sealed container in the refrigerator. I like to use up my salad dressing within 3-4 days while it’s fresh, but it should be fine refrigerated up to a week. Always shake up the dressing in the container to mix up the ingredients well before serving. If oil solidifies while in the fridge (sometimes oil can do that when it’s cold), just let it sit out a bit to get to room temperature and shake it up well. I love to use small jelly jars to make and store my vinaigrettes in. You can find them at Target or Walmart and usually at hardware stores too. Of course, you can look on Amazon as well. You could easily use this vinaigrette as a marinade for chicken or to drizzle over broiled fish and serve with Cilantro Lime Vegetables and Fiesta Lime Rice for a light meal. This homemade citrus dressing is guaranteed to get you back into the salad making mood again, it really will. And if you are in a part of the country that is cold and covered in snow, I promise it will brighten up any winter blues that might be starting to settle in. While you’re at it, add this Clementine Vinaigrette and Honey Balsamic Vinaigrette on your list to try. 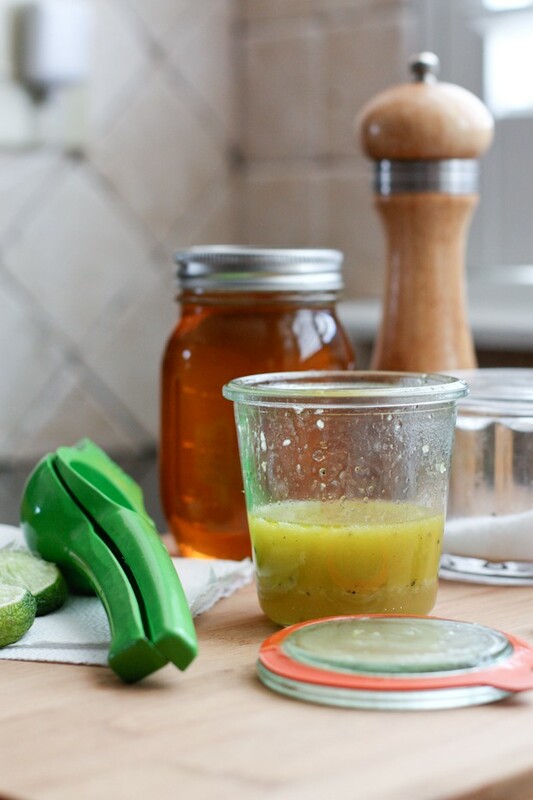 Use this Honey, Garlic and Lime Vinaigrette as a marinade for grilled chicken or seafood, or a dressing for your next salad. Fresh and delicious! Add all ingredients into a jar. Shake until combined. I’m all over this one, Aggie. Honey & lime is a great combo!! Honey and lime are sooooo good together aren’t they? I love, love, LOVE this viniagrette!! This looks great, Aggie! I love the photos!! I love homemade dressings and this looks just delicious. Sounds fantastic! Light and fresh! I’m thinking salad will be dinner tonight! I’m going to plan some salad for dinner nights next week. I’m thinking a grilled chicken taco salad with this would be really good! Whoa I’m loving this honey vinaigrette. Definitely gonna try this. Simple but flavorful! Thanks, Aggie! I hope you do try it Liane, it’s so good! Have a great weekend! This looks like the perfect dressing for a salad! Loving the recipe! I’m SO ready for salads! These are gorgeous pictures and I love the simplicity of this dressing. Looks great! This dressing sounds ideal for a taco salad! I am all over it. Yes!! That sounds like a perfect way to use it. I want to dive into this!! What are winter blues?! Lol T minus 3 months until lettuce season. 😉 lol PS gorgeous photos!! I havne’t been into salads lately but my tight pants are begging me to reconnect with some leafy greens! This dressing sounds simple and bright- just how I like it! I am ready for salads too! It makes me feel like spring is on it’s way. I love trying new vinaigrettes!I can wait to try yours! SO light and refreshing. Perfect topping for my next salad. Aggie. You are my salad soul sister. 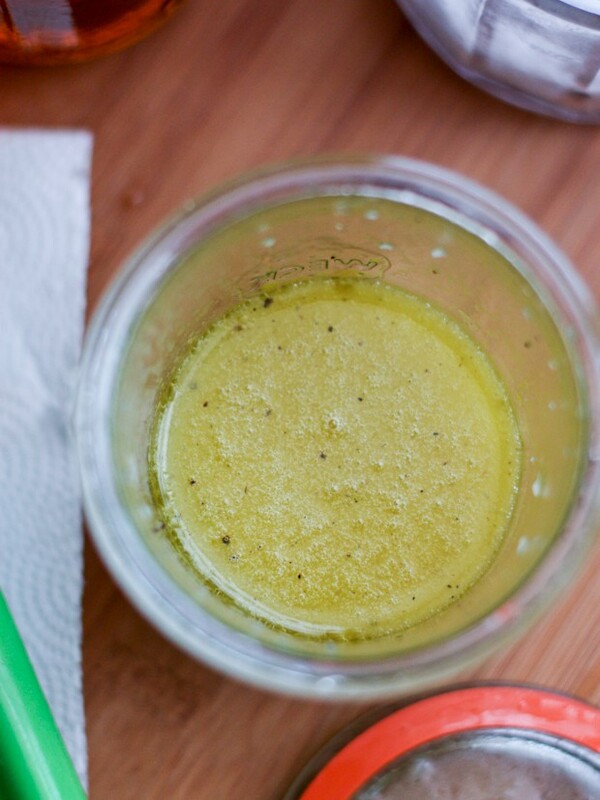 I need this vinaigrette and I need it soon! This sounds just fantastic, and I’m totally with you on the salad thing. It’s definitely time! I follow Genotype Teacher Diet and my son follows Blood Type A Diet: this vinaigrette fits both of us to a “T”. A suggestion: when I crave a creamy dressing, I add lemon vinaigrette to some Greek yogurt. Your lime vinaigrette would work, too. I usually store my homemade dressings for about 3-4 days. Do you store in fridge ? Hey! 🙂 Yes store in fridge. You may need to bring to room temperature before using again if the oil solidifies. This is so simple and delicious. I had some leftover spicy pork tenderloin, and I added some mixed greens craisins, walnuts, and feta cheese. It was the perfect companion. Thank you! One of our families go to dressings! Delicious! Your recipe was my ULTIMATE SAVER for my surprise party. Your instant dressing saved me at the last minute and was much loved by all my guests. A big THANK YOU for this. I have become more of a salad person and so are my kids after having that light and fresh salad dressing.